Short summary: Mac OS X’s default power management settings might wear your hard drive down unnecessarily. This post provides a lot of background information and how to change these settings. As you can see I have a Hitachi 500GB 7200rpm drive. The puzzling fact here is the Load_Cycle_Count. You can see a value of 36,492 load cycle counts in 351 hours the HD was powered on, so approx. 100 per hour. Put easily the load cycle count is how often your HD decided to park its heads. Depending on the manufacturer and HD model this can mean several things. In my case it means the number of times the HD’s heads are moved to a ramp next to the platters. The advantage of this is that being in this “parked” position the drive can shut down some energy consuming parts and it is much harder to damage the drive when the heads are parked (nothing there for a Head crash). The script will log the load cycle count to your terminal and a file called hddLoadCounts.log in the current directory every minute. You might notice that when doing nothing but browsing this count increases by 2-8 every minute. Playing music with iTunes seems to stop this, as the HD keeps busy reading your music. Doing the maths you’ll find that it’s not unlikely that your drive will have over 300,000 load cycle counts withing the first half year (lucky music listeners, yours will last much longer 🙂 ). As I had a bad feeling about this, i went on to have a look into Hitachi’s technical specs for my HD. Here you can find that my HD is designed for up to 600,000 load cycles (page 2), meaning approx. 6000 hours at the 100 cycles per hour rate. In the specs on page 135 you can find that if Advanced Power Management is enabled, the deepest reachable power saving is depending on the Power Management level. In general the Advanced Power Management Level is between 1 (power saving) and 254 (performance). If the Level is 0 or 255 no power saving is done, if the level is 1-127 it’s “Standby”, if the level is 128-191 it’s “Low Power Idle” and if it’s 192-254 it’s “Active Idle”. So how do we find out which Advanced Power Management (APM) Level our HDD uses? This doesn’t seem to be very easy in Mac OS X as there’s nothing like the hdparm on Linux. There is the hdapm tool, but it can’t read the value, you can just set it. We’ll learn why this tool is necessary in a moment, but first let’s find out what the current value is. For me it was 128. You can check the immediate effect from within the Live CD: you can use smartctl -a /dev/sda. As before this kept increasing. As I always handle my laptop with care and can live with 10 % more power consumption of my HD, I decided to change the default. WARNING: This might not be suitable for you, it’s your decision. To stop this rapid growth of the load cycles, I first tried to set the value to 191, but i could still observe a rapid increase. Afterwards i rebooted, the Load_Cycle_Count increased by 1 over the reboot and no more after a couple of hours runtime (without iTunes keeping my HD busy, draining my battery). To my surprise the next day my logs showed that the load cycle count was increasing rapidly again, i rebooted back into linux and found the value was reset to 128. Weird. I reset it, rebooted, the count didn’t increase anymore, but at some point i again found it increasing rapidly. Based on this I assume Mac OS X or something else (like Windows run via bootcamp) sometimes resets that value to 128. My first guess was that maybe it is reset after resuming from sleep, but I couldn’t reproduce it by this. If someone finds out let us know in the comments. To overcome this problem it seems sufficient to have a tool which explicitly resets the APM level once during system startup to something meaningful. That’s where we remember the hdapm tool: You can download it from the given page and install it as described in the user guide. Notice that for other drives, especially other manufacturers the 192 might not be the right value. If you found the correct values for other drives, be welcome to share them (preferably with links to tech specs) in the comments. Edit (Sep. 22, 2011): Revised my guess about sleep causing the reset. Thx to Sam. Does you /Library/LaunchDaemons/hdapm.plist file have the hdapm tool run at regular interval? It seems it only have it run at startup. How to you make sure it’s being regularly set (i.e every few minutes or so, or everytime the macbook wakes up from sleep)? Actually you’re right, my hdapm.plist only runs hdapm once when the system boots. Still my monitoring shows that even after sleeping the load cycle count doesn’t grow, so i’d say it’s enough to run it once at system startup. Should you find out what causes the resetting of the apm value (maybe it’s complete shutdown or a restart from Windows (bootcamp) to Mac OS X again?) let us know. For now I’ll throw out my guess about the sleep & wake being the cause, as that clearly is not the case. Thanks for the reply, and great post by the way! Thank you so much for this post. It’s was in many ways a life saver. I do think my hard disk have some problem… I have a mid 2011 Mac mini it does the clunk sound. It’s annoying as hell. Besides that I love it. I have a Hitachi 5400 rpm. I thought the G-Sense of the disk is malfunctioning. Mac mini is standing still on top of desk. The “G-Sense Error Rate” seems to be “nonsense” on my system as well, but if that thing is just standing still on a desk the high number of “Free Fall Sensor” would make me feel uncomfortable. Sorry for the question, but: do you sometimes hit the table or does it get a lot of “strong vibrations”? i have 2 mac minis. that drive seems totally fine. Well as i said: this depends on the decisions the hard drive manufacturer took for that model and the power management settings. Could well be that the WD scorpio black understands the load cycle count to be something completely different or that they are designed for more load cycles or that you’re just having luck. To find out what it is you’d need to have a good look into their technical specs. My general rule of thumb is: when your pc is idle (i really mean idle, so not doing any background indexing or stuff) and you still hear noise from the hard drive on a regular basis then something is set to wear down the mechanics (as that is what you hear). Sure you can say: “but mine still works”, but why setting it to such defaults in the first place? Especially for a mac mini which is not carried around at all!?! I’ve just got my first Mac (Mac Mini Late 2012), but I’m a master Windows power user and technician, and so naturally one of the first things I did with this new machine was investigate all the hardware in depth, and I noticed my HD SMART Load Count Cycles rapidly increasing. With a 2 week old Mac Mini, it’s already at 8800 Cycles on my factory Hitachi 500GB 5400RPM internal drive. In Windows I deal with this via HDSentinel which has AAM/APM setting adjustment that you can mark to readjust on login. This webpage turned up as one of the first Google results for “how to disable power management mac mini hard drive”. Excellent article! I’ve got hdapm installed and by default it seems to set the hdapm.plist to “max” which evidently covers all drives. I’ll be watching my Load Count Cycles to see what happens. you’re welcome… sorry for the issue with the comment, seems it was silently classified as spam ?!? Thank you for writing this article and for keeping it on line. I found it very useful even after more than three and a half years. It’s an issue that Apple has never addressed and as Apple doesn’t seem to use mechanical hard disks any more it is now not likely ever to be addressed. 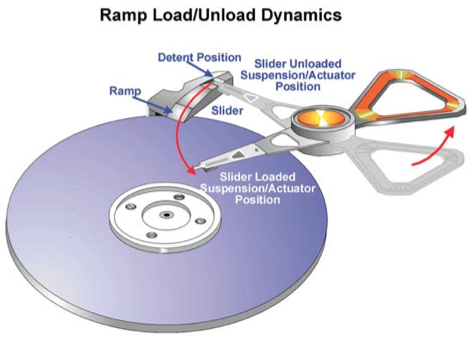 All modern hard disks now use the ramp loading method and that, in itself, is not a bad thing. However, there is great pressure for the manufacturers to show their green credentials and power saving is high on their list of desirable features. Hitachi (HGST, now part of the Western Digital family) drives still behave as you describe, the 18-month old one in my MacBook Pro having accumulated over 2.4 million head load cycles at the rate of about four a minute until I stopped it with this fix. As further evidence that it’s an incompatibility with Mac OS X, the hard disk in my old Windows Vista laptop (actually, the same model as yours) had accumulated only 245 head load cycles in about twice the number of power on hours. Other makes of hard disk are also affected. I know of another MacBook Pro with one of the Toshiba hybrid SSHDs that was also accumulating head load cycles at a worrying rate. In this case setting a value of 192 didn’t seem to make much difference, while at value of 254 did the trick. I haven’t been able to get such a detailed data sheet from Toshiba – the ones from Hitachi are excellent. I also know of a Mac mini that was fitted with a Western Digital Blue drive that was also accumulating head load cycles at an uncomfortably fast rate. This seemed to be caused by a different but related problem that was fixed without having to apply the hdapm fix. There is a range of Western Digital drives that are specially optimised for power saving. WD calls them the Green series and markets them specifically as secondary storage devices, pointing out that they are not meant for use as system drives because they unload their heads after as little as eight seconds of idleness. WD makes a whole variety of products that are optimised for different purposes – the Red range for NAS use, the Black range for performance, the Blue range for everyday value. It seems that while the Green drives unload their heads after eight seconds, the Reds and Blues have a longer idle timeout of five minutes, while the Black ones never unload the heads simply to save power. WD gives this timer a name, Idle3, and it seems that there are batches of Red and Blue drives out there that have the Idle3 timer incorrectly set to eight seconds in the factory. I don’t know whether WD has actually admitted to this error but it did release a DOS utility called WDIDLE3.EXE for power users to adjust this timer. I’ve used it myself to correctly set the Idle3 timer of two WD Scorpio Blue drives to five minutes – as new they were set to eight seconds. To conclude, then, the head load cycle count is a problem, especially for Mac users who have mechanical hard disks. It’s been a problem for years and neither Apple nor the drive manufacturers have much inclination to address it. There’s the related but different WD issue, but at least there’s a tool to fix it. For other makes of drive the hdapm tool works well. just a big thanks out to you for this elderly post. Saved us some bucks and hazzle, as we are running a bunch of mac pros and hackintoshs with complex raid arrays. Thanks for all the good advice, the APM helped already. Some other worrying thing with the FreeFall Sensor count . I have a iMac from late 2012 with 8014 hours run time. Fully updated. The iMac is very slow. What is next to do? hmm, if those values are accurate, you should really back up your data and replace the drive. looks like imminent drive failure to me. IOW, since all 8 nibbles (i.e., full 32bit) are zero, I’d think that one can safely assume that the counter part is zero (IOW, nothing occurred), and at most some “flag values” are set (but I’d be inclined to think that that is just improper evaluation of vendor-specific stuff). YES! Thank you so much for this easily accessible article. Thank you for the interesting contribution! So, about to pack in? Finally, reached here. To save my little poor HDD from ticking sounds!